YoYoJam's very first production yo-yo. This freshmen release came with an instruction sheet, and enclosed in a clear plastic envelope. Has adjustable string gap, ball bearing axle, and polycarbonate body. Note that this first version is blue and did not have sidecaps; later versions were red or black and included sidecaps. YoYoJam's sophomore release was the DragonFly. 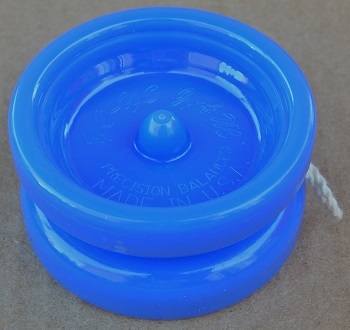 The Spin Jammer and the DragonFly were both introduced at the 1999 World YoYo Contest in Florida. After more than 16 years, YoYoJam officially closed its doors and went out of business Wednesday, December 30, 2015.